Hiya! What an amazing day this was! Emily and Joe got married in York City centre, and then as a surprise, The New York Brass Band played them through the streets to celebrate, it was honestly unreal. People on the streets were getting involved and heads were hanging out of windows and shops, it was like a parade! Emily and Joe got married on a lovely Friday in November. I met Joe at Hotel Indigo in York where he was just finishing getting ready with his Best Man, and then they went for a few beers while Emily and her party arrived at the hotel to get ready. 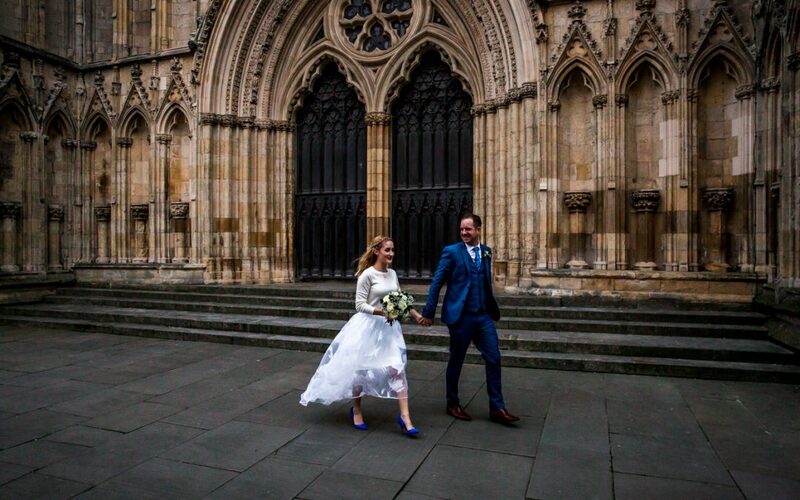 We then all jumped in Taxis and headed over to York Registry office for the ceremony. York Registry Office really is a beautiful little building. After the ceremony Emily and Joe, plus all their guests were surprised with The New York Brass Band walking round the corner and smashing a few songs out. After that, they paraded us all through the streets of York and it was amazing! These guys are amazing, you need to check them out, people were coming out of the shops and joining in dancing on the streets with them! Emily and Joe have even said their favourite part of the day was the brass band playing them through York, It was such a buzz and everyone around us was having fun. About half way through walking through York, we stopped off at a pub and people enjoyed a few pints while the band played outside in the beer garden, again such an amazing experience! Later on, we headed through the streets again to get to the evening venue, which was the Star inn the City, a beautiful building on the edge of the river. Just before the meal the three of us went back onto the streets to get some pictures, and Im so pleased we did, the shoppers had all gone home and we practically had the city to ourselves! Emily and Joe say a top tip for future brides and grooms is to do what you really want as a couple, and not what your family and friends want. Make sure the day is about you and not everyone else. York is one of my favourite cities and I love any excuse to go there. If you’d like one of my brochures sending over, pop your info in the boxes below!